The pre-combustion separation of CO2 is one of the techniques used for capturing and sequestering CO2. 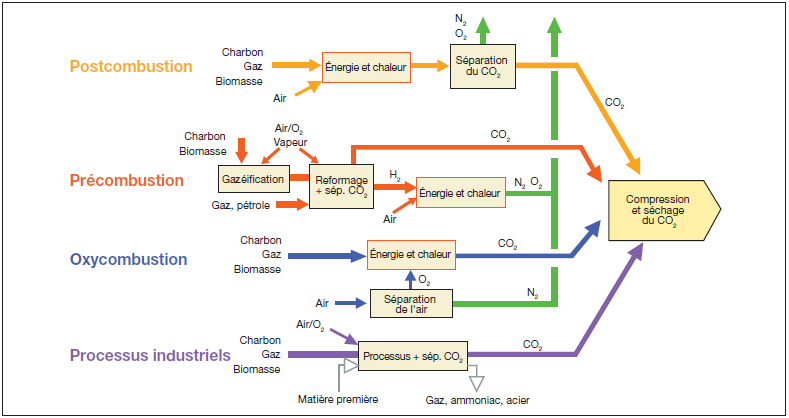 This process consists in treating fuels (oil, coal...) upstream of their combustion. These fuels are first gasified in a reactor exposed to air, water vapour or pure oxygen, in order to produce a syngas composed of carbon monoxide (CO) and dihydrogen (H2). This syngas then passes through a conversion reactor where it is exposed to water vapour. The carbon monoxide reacts with the water (H2O) and produces carbon dioxide (CO2) and more hydrogen (H2). The pressure and concentration of the carbon dioxide (from 15 % to 60 % dry volume) then facilitates the separation of CO2 and hydrogen. The concentrated CO2 can then be sequestered. This process is more complex and more expensive than post-combustion separation, but it produces a more concentrated gas under high pressure, which makes separation easier. It is generally applied in cycle power stations combined with incorporated gasification.